Apologies…I posted this yesterday but there seems to be a glitch and many people can’t view it and/or the comments. Please see our tribute to Mummy below. If you were already able to view it, please disregard. We give thanks for Wendy, aged 71, who danced her way to the other side in the early hours of June 4th as the sun kissed the horizon and the birds began to sing their chorus. Daughter of the late Francis Jean and James Jarvis Gleed, widow of Alasdair Gordon Bruce Wallace, mother of Elizabeth and Margaret Wallace, sister of Peter Gleed and Susan Morton. Dearest Wendy. A tender heart, a seeker. A woman of grace. An artist. A creative camp fire cook, who found beauty in all things natural. Who made masterpieces from bleached grasses and driftwood, seed pods and fragile ephemera. Whose meditation was the knotted tree, the wrinkled face. Whose paintbrush and charcoal captured the red of dogwood, the curve of the icy stream, the green serenity of the marsh. Who both loved life-drawing and found life through drawing. Who danced her joy, her pain, her hope, her life, who drummed with all her heart. Who clowned her way to happiness, bravely facing her own darkness to emerge into light. Who cradled the broken and fragile in a heart of compassion, trusting resilience and grasping hope. Who made piñatas for grandchildren, spending hours on the floor, living life through their eyes. Who sought to listen well: To her friends, to the spirit, to creation, to her heart, to the mystery of life. Fondly remembered, always, for her gentle legacy of love. Her ceremony of life will be held at Highland Park Funeral Center in Peterborough on Thursday June 26th at 1:00pm. Donations can be made to the Steven Lewis Foundation. Mommy’s continuing to defy all the doctor’s predictions. While she’s increasingly more tired and frail, she’s been entertaining us with one liner wisecracks from time to time between naps. This morning she ate a whole banana with yoghurt and put back a whole glass of water. Little, but big, things. Wendy is back at Empress! Hurrah! She’s excited to be back to her ‘team’ at Empress. They do give such wonderful care on the enriched care floor. Hope to see some of you over the next few days when I’m back to visit over the weekend. As per Mommy’s wishes, the current plan is for her to be transferred back to Empress tomorrow. She’s increasingly more groggy and is suffering from mild headaches, but she seems to be managing with some pain medication. She often appears asleep, but is merely resting. She continues to enjoy listening to updates and stories. Fynn told her all about his piano lesson today, which she enjoyed. He was also keen to tell her about the Easter Bunny’s deliveries. Elizabeth and family are still in the area visiting, and Mommy’s brother and sister have both been to visit. I (Meg) am returning on Friday for the weekend. Thanks to everyone for all your well wishes and kind gestures. They really do carry us! As you hopefully know from the last post in March, Wendy recovered beautifully when we took her completely off the Decadron. She returned to the Wendy we all know and love. She was cracking jokes, enjoying walks and has been in a bright and lovely sunny disposition. Fynn and I spent a lovely 2 days with her on Friday and Saturday. We went out for Sushi, enjoyed a play in the park, and even went to a movie. Sadly, the MRI results of early last week confirmed our suspicions. The tumor has regrown quickly, and without the counter-effects of the Decadron, the swelling has returned as well. It’s Mommy’s wish, and ours as her decision makers, not to use Decadron again. In a very short period of time, even since Saturday, she’s lost her ability to balance and has suffered a few major falls. She can no longer walk, her speech is impaired, and her right side is very weak. She is increasingly more drowsy. Her care team has informed us that her decline will be quick; there will be rapid changes, from which she will not recover. She may plateau there for a bit before further decline. The silver lining is that she’s relatively comfortable and happy. If you do visit, please keep it light and refrain from talking about the situation. She loves updates, especially about children and grandchildren. Short visits (5-10 minutes), with only 1-2 people at a time are best. Avoid ‘conversation’ between guests as she finds them challenging to follow. 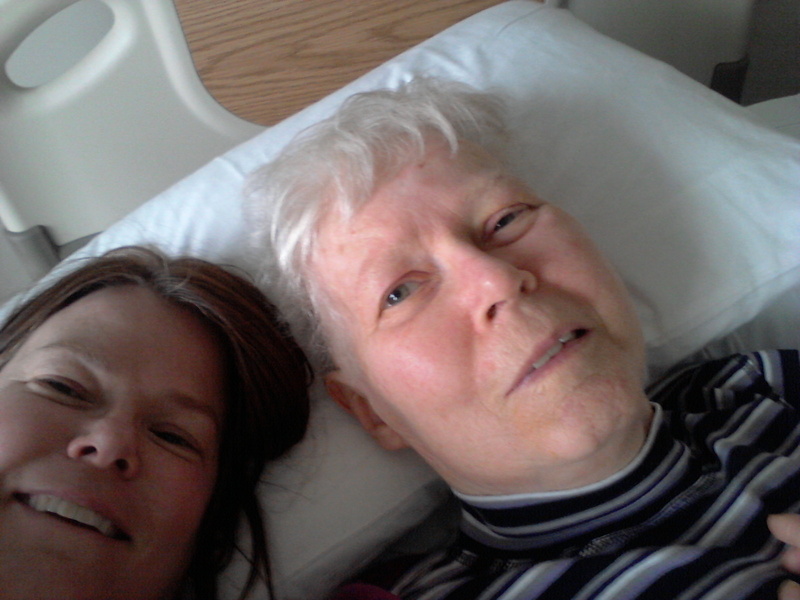 She is presently in the palliative care unit in Peterborough, but it is her wish to return to Empress. We are working on making arrangements there to meet her increased care needs. We will let you know when the move happens. Fynn and Nana on Saturday Apr.19 at Empress Gardens. A Meg/Nana selfie from yesterday, Apr. 21st, in the Palliative Care Ward. On Monday, Elizabeth and I, plus a number of people from Mommy’s care team, met to review Mommy’s progress and make a plan of next steps. In a nutshell, she was discharged and moved back into Empress, all in the same day! With so many changes in such a short period of time, she’s finding things a bit overwhelming, so we’re asking visitors to keep visits short (5-10 mins) until she gets settled into her new digs. She’s been having her meals in the main dining room with her previous table mates, and today even went out for lunch with a friend! It feels great to be able to write some much more positive news! Mommy/Wendy has improved remarkably now that she’s been fully weaned off the Decadron. She’s regained her speech and can maintain short conversations. Sometimes the words are hard to find and still slow to come for her, but we’re so grateful to be able to communicate with her again! She’s also regained some of her strength and can get up out her bed and chair walk with her walker. She’s quite self-conscious about her challenges and her anxiety level can be high. As such, we’d like visitors to keep visits short 5 minutes is good – maybe 10 minutes maximum. 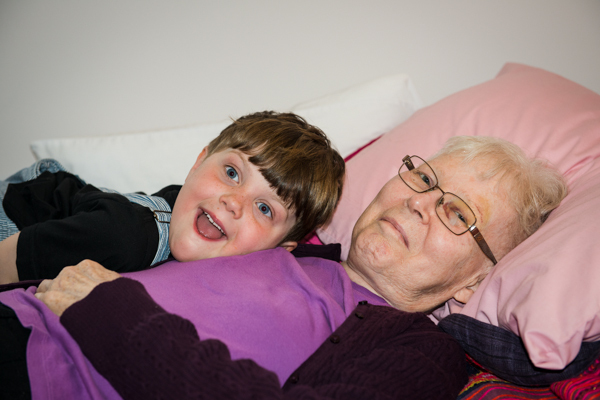 Please call the palliative care unit before visiting to see how many visitors she’s had and postpone your visit if more than 2-3 people have visited. The number of the ward is 705-740-8050. We’ll keep you posted on any new news after tomorrow’s meeting. Having a few stories on hand to share with her can help facilitate the conversation. If you do ask her a question, please give her a little time to respond. Hugs to you all – you have been such a wonderful support!